1. This led night light produce a 3D optical visual lighting effect of stars planets galaxy while the light body itself is only an acrylic flat . light weight, portable. 2. This children's night light has 7 color change : Red, Green, Blue, Yellow, Cyan, Pink, White. 3. This kids bedroom desk lamp is very easy to operate: it can run with 3x AAA batteries (not provided) or be connected to the power via a USB cable (need an extra adapter). Turn on/ off the light and change the color by simple touch control. 4. This led desk light would be an ideal nursery deco lighting for your kids room and baby rooms. Appeal to children very much as a best birthday / festival gift for them. 5.This kids nursery nightlight is made of high quality acrylic and ABS material. Safe for use for your small children. Color change: red, green, blue, yellow, cyan, purple, white. Can fixed one color or 7 color gradual changing. Welcome to our shop for a pleasant shopping experience! Our products have been well tested before sending out. Please feel free to contact us if you have any questions. 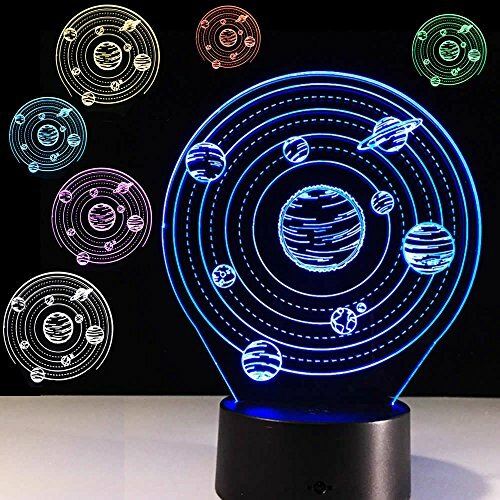 This led night light produce a 3D optical visual lighting effect of stars planets galaxy while the light body itself is only an acrylic flat . light weight, portable. This children's night light has 7 color change : Red, Green, Blue, Yellow, Cyan, Pink, White. This kids bedroom desk lamp is very easy to operate: it can run with 3x AAA batteries (not provided) or be connected to the power via a USB cable (need an extra adapter). Turn on/ off the light and change the color by simple touch control. This led desk light would be an ideal nursery deco lighting for your kids room and baby rooms. Appeal to children very much as a best birthday / festival gift for them. This kids nursery nightlight is made of high quality acrylic and ABS material. Safe for use for your small children. If you have any questions about this product by Ideemoor, contact us by completing and submitting the form below. If you are looking for a specif part number, please include it with your message.